The Revo 4 is the ultimate party by itself. The Revo 4 uses 256 LED beams to display designs and patterns that go along with the beat of your music. On the wall, ceiling, or floor this lighting system will give you a dance floor anywhere. Club quality brought to you for any occasion. Use with the DJ less DJ sound system and have the entertainment of an expensive DJ without any hassle. Requires a tripod light stand for proper use. 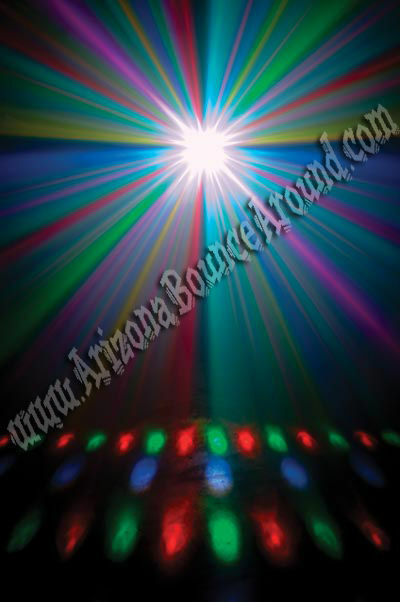 Rent DJ lights in Denver, Colorado Springs, Aurora, Fort Collins CO from Gravity Play Events today.